If you find yourself in last place, like Kanyon, don't worry, Bullet Bill to the rescue. 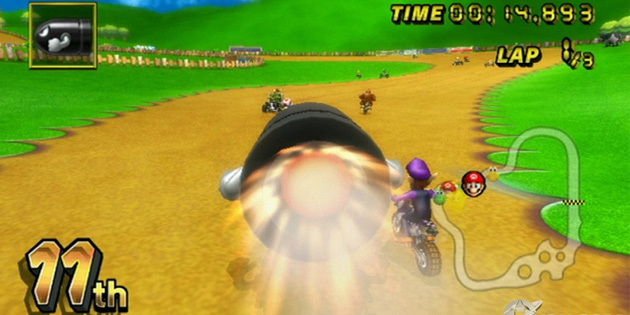 Bullet Bill is Mario Kart's version of grace and unmerited favor. All you need to do is be in last place, or close to it, find an action square, and then press B. Bullet Bill takes care of the rest. You're rocketed past competitors as Bullet Bill takes control and drives your kart for you. Most times you'll start in last place and when Bullet Bill is through, you'll be near the front of the pack. I've even used this as a strategy. Hang out in the back of the pack, but close enough to not be too far behind, and then get Bullet Bill to win the race. Truly, truly, I say to you, the first shall be last and the last shall be first.